What is Newt Fencing and why is it important? If you’ve ever visited or walked past a construction site in a rural area or driven along a busy road through the British countryside, the chances are that you will have seen newt fencing. You might even have spent a moment or two wondering about what it is and what exactly it’s for. If that is the case, you will find all of the answers you could possibly want regarding what newt fencing is and why it’s important, right here. What Exactly is Newt Fencing? Also sometimes known as reptile fencing, amphibian fencing or temporary amphibian fencing (TAF), newt fencing is a generic term used to describe a wildlife barrier installed to keep newts, other amphibians and reptiles in or out of a specific area. Often placed alongside a busy road or around a construction site, newt fencing is used to manage the movement of such creatures in an attempt to keep them safe from harm. The design and installation of newt fencing can vary from one instance to another, but generally it is constructed according to instructions set down within a document known as the English Nature Great Crested Newt Mitigation Guidelines. Those guidelines stipulate that the base of newt fencing should be buried in a narrow trench and feature a right angle return beneath the ground. The top of the fence, meanwhile, should also include a similar return so that the fence in its entirety will take on an elongated C shape. In terms of construction material, newt fencing is generally made up of sheets of polythene supported by wooden stakes at regular intervals. Polythene, however, only has a lifetime of around two years so if a more permanent solution is required, the fencing can also be constructed from rigid plastic board or steel sheets. Why is Newt Fencing Important? Now that you know exactly what newt fencing is, you’re probably wondering why it matters and why it is becoming a more familiar sight around Britain. 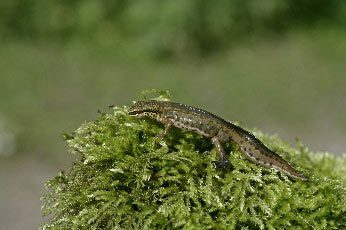 The answer to those questions is largely related to the well being and the survival of the Great Crested Newt. Designated as a ‘strictly protected fauna species’, Great Crested Newt numbers have been declining significantly all around Europe. Great Britain is one of the few places where the species still exists in comparatively large numbers, and in order to protect them the British government passed the Wildlife and Countryside Act. That legislation makes it an offence to intentionally disturb, injure or kill the Great Crested Newt and also to disturb or to damage their habitat. As such, therefore, individuals or companies undertaking any kind of activity that may harm Great Crested Newts – such as construction of new properties or access roads – must take measures to attempt to avoid such harm. Installing newt fencing is the most effective such measure available and can be tailored to suit any particular circumstances. The fencing, after all, can be used to simply keep newts out of a site, to trap them and relocate them if it’s suitable to do so or to control the direction of their travel. Newt fencing or amphibian fencing is crucial, therefore, as it plays a key role in protecting an endangered species and is the most effective way for organisations and individuals to avoid falling foul of government legislation.